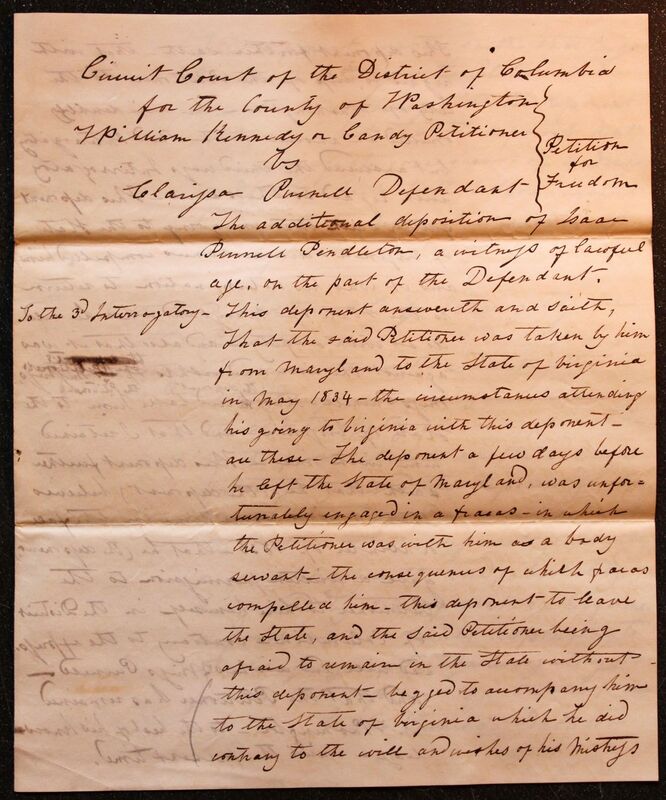 The additional deposition of Isaac Purnell Pendleton, a witness of lawful age, on the part of the Defendant. To the 3d Interrogatory. 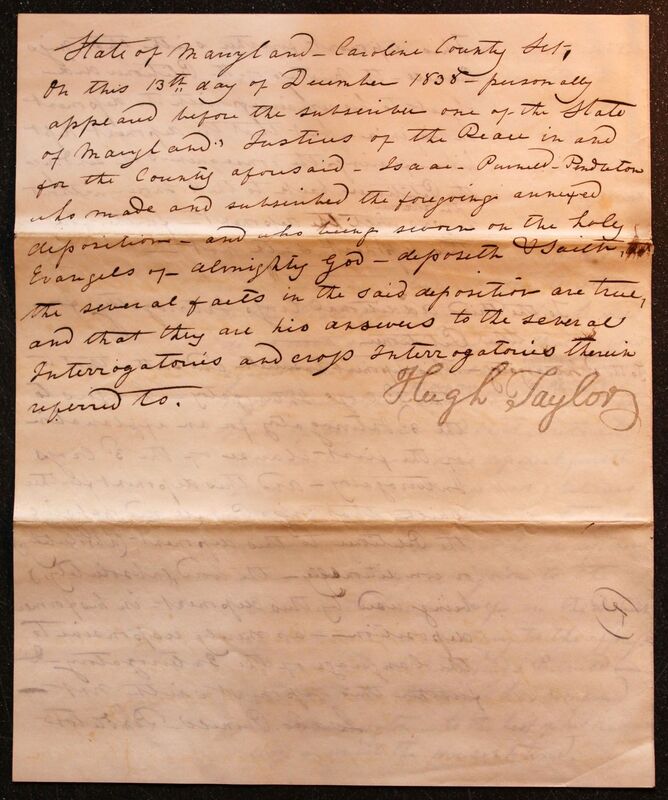 This deponent answereth and saith, That the said Petitioner was taken by him from Maryland to the State of Virginia in May 1834. The circumstances attending his going to Virginia with this deponent are these. The deponent a few days before he left the State of Maryland, was unfortunately engaged in a fracas, in which the Petitioner was with him as a body servant. The consequences of which fracas compelled him, this deponent, to leave the state, and the said Petitioner being afraid to remain in the State without this deponent, begged to accompany him to the State of Virginia which he did contrary to the will and wishes of his mistress This deponent further saith, that with regard to the trip of the Petitioner to the City of Washington, he accidentally omitted an answer to the third Interrogatory but answered the third cross Interrogatory with regard to the same. This deponent further saith that in going to the State of Virginia, circumstances compelled him, and it was his determination to return to the state of Maryland when he could do so with safety. And also that it was against the will and wishes of Petitioner's Mistress Miss Purnell. That he (the deponent) take him (the Petitioner) to the state of Virginia, and that I retained him with me. This deponent further saith that he (the deponent) believes that it was some time in the fall or winter of 1836, that he (the deponent) gave a written permission to the Petitioner to hire himself in the District of Columbia, contrary to the expressed will and wishes of Miss Purnell, and that the Petitioner has remained in Washington, to the best of his knowledge, until the preset time. 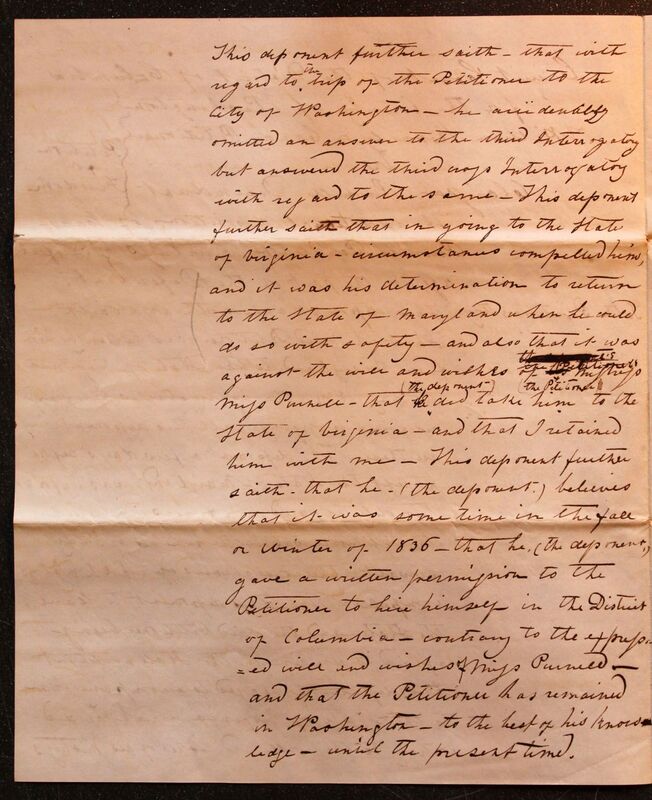 This deponent further saith that Miss Purnell, the mistress of the Petitioner did object to his remaining with the deponent in Virginia, but that the deponent kept him, fearing the consequences of sending the Petitioner back to the E. Shore, without the Petitioner he was with the deponent, furthermore this deponent saith not. To the 3d Interrogatory. This deponent answereth and saith, that to the 3d Cross Interrogatory, he refers to the 3d Interrogatory for an explanation of the first clause of the 3d Cross Interrogatory. And this deponent further saith that Miss Purnell did not give the Petitioner to this deponent (absolutely,) or conditionally. The word (absolutely,) being used by this deponent in his former deposition, as merely responsive to the language of the Interrogatory & further this deponent saith not. State of Maryland, Caroline County Sct. 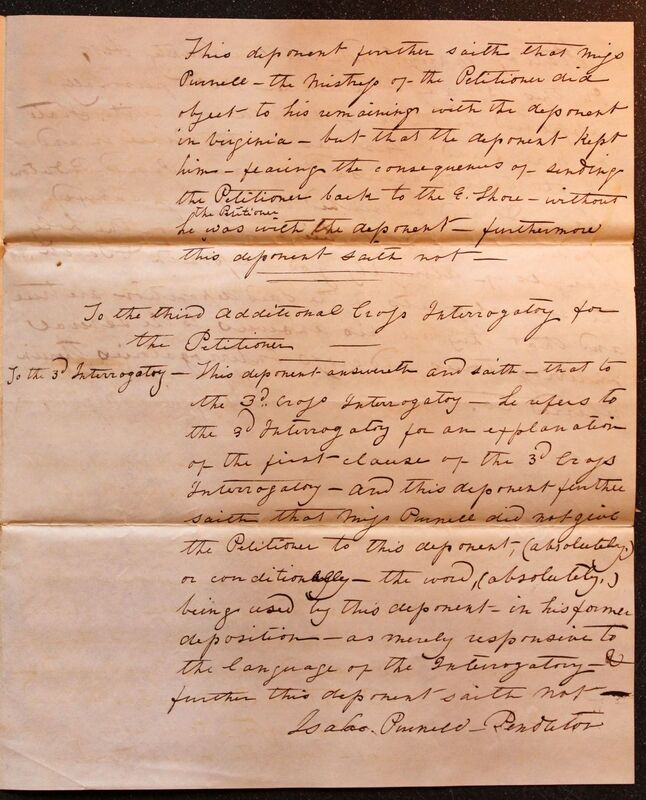 On this 13th day of December 1838, personally appeared before the subscriber one of the State of Maryland Justices of the Peace in and for the County aforesaid, Isaac Purnell Pendleton, who made and subscribed the foregoing annexed deposition, and who being sworn on the holy Evangels of Almighty God, deposeth & Saith, the several facts in the said deposition are true, and that they are his answers to the several Interrogatories and Cross Interrogatories therein referred to.